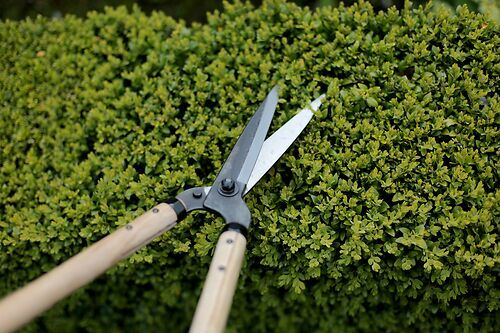 Simple, hard wearing & sharp - great garden shears for hedges, shrubs and topiary. My new best friend - bring on the summer! The very best option for an all-round pair of garden shears - ideal for hedges, shrubs, box clipping and topiary. Hard wearing SK steel holds its edge and puts up with a bit of mistreatment here and there, while the white oak handles are the perfect length for everyday use, and have subtle but satisfying bulges half way down, offering a subliminal hotspot for where best to hold them for optimal balance. Comes with a heavy duty leather sheath. NB. the Long Pair are not stronger than the Standard size. If anything they are weaker, with the longer handles under more stress. They are not loppers and should not be used for hard woody cuts, especially when fully stretched. Niwaki Tip: Keep them clean, and keep them sharp. We say that about everything, but it's never truer than with shears.